Last month, we covered the best virtual reality headsets for use in architectural design and visualization. The truth of the matter is, though, that these awesome pieces of hardware are nothing without some intuitive, hassle-free software to capitalize on their creative potential. Given the rapid rise of VR and augmented reality technology in the AEC industry, it is no surprise that some of the biggest players in architectural software are racing to develop programs that they hope will become the standard accompaniment for these devices. Below is a rundown of just some of the software that architects can harness to create an incredibly immersive VR experience. Including applications that convert your 3-D models to VR environments in a single click and powerful gaming engines capable of taking realism to the next level, these are programs that all innovative designers should investigate. Autodesk LIVE allows users to transform Revit models and step inside their own designs to share and present. It launched in July last year, and they’ve since added VR functionality (note the icon in the bottom right corner of the above screenshot). AEC professionals can upload BIM models to the cloud with just one click, and interactive visualizations can be published to mobile. This gives clients a better sense of your design early on so changes can be made with minimal disruption or delay. 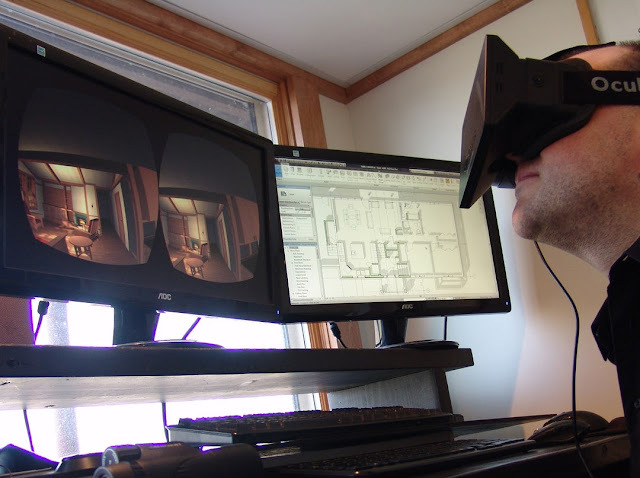 Fuzor instantly transforms Revit or SketchUp models into virtual reality experiences. This is a great tool for construction because it greatly speeds up the process to get designs into VR — allowing users to iterate and improve on their designs. Enscape is a Revit plug-in that creates a VR walk-through with one click based on your BIM data. There is no need to download or learn how to operate additional software. All materials, geometry and entourage come from your Revit project and can be changed during the VR simulation. This flexibility allows spontaneous presentations with the real-time rendering quality you know from modern games, but from within the architectural design workflow. Combined with the Oculus Rift, customers can virtually walk through your Enscape project and experience it as if it were already built. Shapespark enables interior designers and architects to create real-time web-based visualizations with physically accurate lighting — perfect for meetings or presentations with clients. The visualizations can be shared via links and support the Oculus Rift virtual reality headset, providing users with a stereoscopic 3-D view. Since Shapespark uses WebGL, a web technology supported by default by all modern operating systems and browsers, visualizations can be comfortably explored directly in the browser with no plug-ins required. Unlike static renders, Shapespark allows the viewer to freely enter and walk around a space, examining every detail. Translating CAD or BIM models into virtual reality experiences used to take considerable time and programming know-how. With the advent of the Unity gaming engine, bringing Revit/3D models into a virtual reality space becomes much easier. Now, any AEC professional can take their Revit model, bring it into Unity and create a VR experience. With a bit of programming knowledge, the VR models can also be heavily customized. This powerful, intuitive and flexible tool ensures rapid iteration and fluid workflow, thus allowing engineers and architects to create stunning interactive walk-throughs and provide clients with a realistic sense of how it would feel to actually live in the simulated environment. Unreal is a suite of tools for developers that can be used to create games and virtual reality environments. It is free for the architecture industry and is frequently used to visualize spaces and render architectural models in immersive environments. This tool enables engineers and architects to design and build in a virtual reality environment by means of a powerful editor tool-set and the interaction models that have been specifically designed for VR world-building. The outcome is a believable immersive experience built upon natural motions and interactions. Released in August 2015, this technology offers AEC professionals an enhanced level of visualization with a simple one-button rendering in Revit. Autodesk Stingray provides an immersive real-time experience between AEC firms and their clients to create BIM-informed 3-D visualizations in 3ds Max. This tool is working to catch up with mainstream game engines Unreal and Unity. Steam is an online entertainment platform and community that provides access to over 3,500 games. SteamVS was just released, which is a full-featured, 360-degree, room-scale VR experience comprised of an HTC Vive headset and two wand-shaped controllers. The tracking system is precise and fast and can be used to map a room’s boundaries, which can be included in the VR experience. The controllers make use of haptic thumb pads, which can be split into directional inputs or a number of “buttons.” In the near future, Steam could be used to host AEC content/environments for SteamVR. UNIGINE is a proprietary cross-platform game engine developed by Russian software company UNIGINE Corp. Apart from its use as a game engine, it is used for virtual reality systems, serious games and visualization. Due to its sophisticated lighting and shading models, advanced special effects, accurate atmosphere model and lifelike post-processing, UNIGINE delivers near-photorealistic 3-D assets that make it the ideal tool for multiple industries. Its advanced renderer supports both OpenGL 4.0 and DirectX 11. Introduction by Architizer/Paul Keskeys; the rest of this article is part of a feature originally published on VIATechnik.